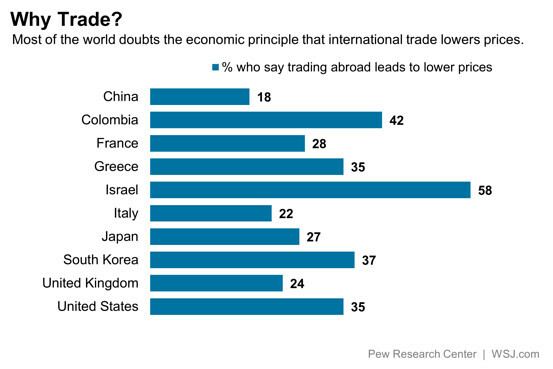 Does Free Trade Raise Prices? (ii) [C]omparative advantage is a harder concept than it seems, because like any scientific concept it is actually part of a dense web of linked ideas. A trained economist looks at the simple Ricardian model and sees a story that can be told in a few minutes; but in fact to tell that story so quickly one must presume that one’s audience understands a number of other stories involving how competitive markets work, what determines wages, how the balance of payments adds up, and so on. (iii) [O]pposition to comparative advantage — like opposition to the theory of evolution — reflects the aversion of many intellectuals to an essentially mathematical way of understanding the world. Both comparative advantage and natural selection are ideas grounded, at base, in mathematical models — simple models that can be stated without actually writing down any equations, but mathematical models all the same. My emphasis. See you tomorrow. Energy Independence: At What Cost? Don Boudreaux at Cafe Hayek argues persuasively that energy independence and comparative advantage are not likely to be compatible for the U.S. If we wish to specialize in energy production, it will be more expensive in terms of economic welfare than importation; thus, we must either accept a lower standard of living or import something else. What makes energy so special that we should not trade for it? Should we instead import more food, pharmaceuticals, or technology, for example. In short, the doctrine of comparative advantage suggests that we specialize in things that we are particularly adept at producing and trade for other goods and services. 1. Are you fearful that we will run out of energy (especially from carbon based sources)? 2. Are you fearful that we will not run out of energy from carbon-based sources? Higher prices can ensure that the first won’t happen but not the second. Concerns raised by positive answers to the second question won’t be addressed until we have a price for carbon-based energy that is higher than for clean fuels. Certainly, energy independence (i.e., no importation of carbon-based fuels) will lead to higher prices, but it also would be a very expensive way to achieve the result as the domestic price would have to rise enough to clear the domestic market. It’s not clear, however, that this would be a price that internalizes the greenhouse gas effect. Posted on July 28, 2010 July 28, 2010 Author Merton FinklerCategories General InterestTags Comparative Advantage, Energy, We Get It!